I have written about pictopiesis as a simplification, there is a filtering and distilling going on throughout. The synthesis, a sublation, is a simplification but not an over-simplification, as that would eventually lead nowhere if followed through. I am in a situation with the painting whereby it has an internal pictopoietic dialectic. The different arguments, negative and positive have to listen to each other well enough to be able to absorb each other partially, sometimes wholly. This is the way the whole of it moves forward. This has correspondence with homeostasis which I often cite, which is regulated by a constant rebalancing act of feedback loops. The painting now presents itself as an increasing complexity which I can only confront by following my process, trusting in it. I have no other way of making the decisions I need to move it on. In pictopoiesis I recognise that I am what gives the painting its internal source of motion. In the biological sense, I am alive, and the painting is not but it becomes a reflection of my aliveness. As if to reciprocate, the actual doing of it makes me feel extra alive, which is what makes this work worth doing even if I were to have no audience for it. The painting’s complexity will build up more and more, and I am no more than half way through it. If I let myself, I would be overwhelmed by it, I have to control myself in the process, not be fearful of it. There are things in the painting which I love and which I know I may have to lose; that is the nature of the sublation. Unpredictability and uncertainty represent opportunity when I have control over, have actually structured the containing process. One thing has sprung into my mind suddenly: I just remembered, a long time ago, when we were in Florence, Alexis told me a story of how Leonardo da Vinci used to buy caged birds in the market and free them because he could not bear to see them imprisoned. 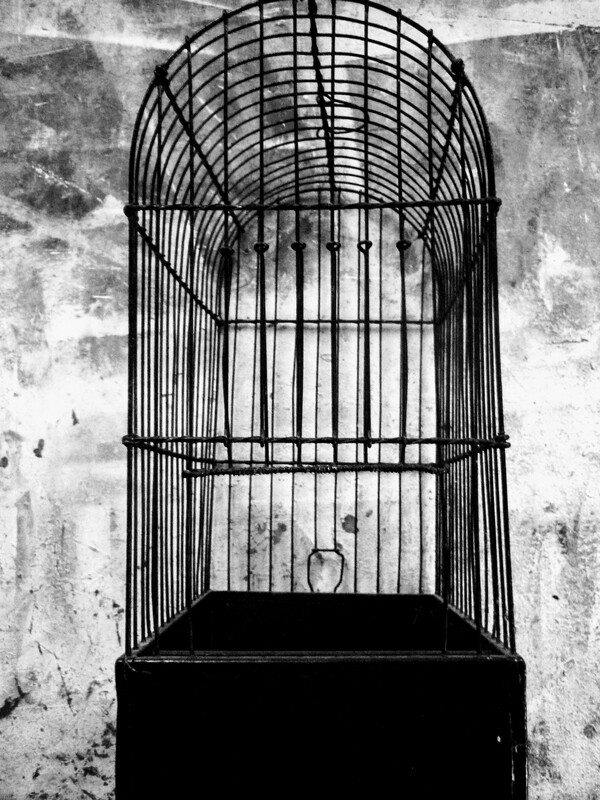 I find empty bird cages poetic, and have a small collection of them. Posted in Context, Experimental, Free Writing, Lines, Methodology, Notes to Self, Pictopoiesis, Research, show building blocks, Uncategorized, Unfolding Pictopoiesis, Work ongoing. Tagged cage, dialectic, distilling, filter, Hegel, Leonardo da Vinci, sublation, synthesis.